Type II restriction endonucleases (restriction enzymes, RE) are the bacterial site-specific DNA-endonucleases that recognize short (usually 4-8 bp) DNA sequences. These enzymes are of simple structure and widely used in molecular biology and genetic engineering experiments. At the present time more than 250 restriction endonucleases with different specificities have been discovered. Some of restriction enzymes recognize degenerate sequences, i.e. more than one sequence. Only 9 of them recognize palindromic and non-degenerate octanucleotide sequences . This work describes an isolation and the properties study of new site-specific endonuclease AbsI recognizing octanucleotide DNA sequence 5’-CC^TCGAGG-3’. Morphological and biophysical properties of bacterial strain Arthrobacter species7M06 were determined by a standard method . GC-composition of chromosome DNA of this microorganism was determined as described previously . The products of Organotechnie Company (France) were used as components of nutrient medium for bacterial cells growing. Arthrobacter species7M06 was grown at 28°C in flasks containing 300 ml of LB medium (1% trypton, 0.5% yeast extract, 0.5% NaCl, (pH 7.6)) in G-25 (New Brunswick, USA) shakers. The cells were grown for 48 hours when an optical density (λ=550 nm) reached 2.5. The cells were collected by centrifugation for 30 minutes at 3000 g on a Beckman J2-21 centrifuge (Beckman, USA) and frozen. All the enzyme purifications were performed at 4°C. Frozen cells (30 g) were suspended in 120 ml of buffer A (10 mM K-phosphate (pH 7.2), 0.2 M KCl, 0.1 mM EDTA, 7 mM 2-mercaptoethanol) for 3 hours. The cells were disrupted in a Soniprep 150 disintegrator (MSE, Great Britain) with ten 1-minute impulses at 1-minute intervals. The cell debris was removed by centrifugation at 12000 g for 30 min on a Beckman J2-21 centrifuge. AbsI enzyme was isolated by chromatographic purification on three columns. First, supernatant was loaded on 40 ml of phosphocellulose P11 (Whatman, Great Britain). Enzyme elution was performed with 400 ml linear gradient of KCl (0.2-0.9 M) in buffer A. Active fractions were applied to 5 ml of hydroxyapatite (BioRad, USA) equilibrated with buffer A. The column was eluted with 120 ml of linear gradient of K-phosphate (0.01-0.2 M) in buffer A. Active fractions were pooled and applied to 4 ml of heparin-sepharose (Sigma, USA). Enzyme elution was performed with 60 ml of linear gradient of KCl (0.3-1 M) in buffer A. Active fraction were collected and concentrated by dialysis against a buffer containing 10 mM K-phosphate (pH 7.2), 0.2 M KCl, 0.1 mM EDTA, 7 mM 2-mercaptoethanol and 50% glycerol. Before dialysis BSA was added to concentration 0.05%. To test RE activity of AbsI in the chromatographic profile, 1 μl-aliquots from fractions were added to 20 μl of the reaction mixture containing 0.8 μg of DNA pBlueScriptSK(+) preliminarily linearized with restrictase ZrmI in SE-buffer 5 “G” (10 mM Tris-HCl (pH 7.6), 10 mM MgCl2, 50 mM NaCl, 1 mM DTT); the mixture was incubated for 15 min at 37°C. The reaction was stopped by addition of 5 μl stop solution containing 0.1M EDTA, bromophenol blue and 40% agarose. Electrophoretic separation of the reaction products was performed in 1% agarose gel in tris-borate buffer. 2.5 ml of AbsI preparation with activity 1000 units/ml was obtained and stored at -20°C. Lambda and T7 DNAs, adenoviral DNA type 2 (Ad2), plasmid pBlueScriptSK(+) (pBS)  and specially designed plasmid pUC19SE (its preparation is described below) were used as substrates for AbsI recognition sequence determination. Hydrolysis products were separated by electrophoresis in 1% agarose gel in tris-acetate buffer. DNA oligonucleotide-duplex (one chain was labeled with γ-[32P]-ATP by T4-polynucleotide kinase) was used to determine the cleavage positions of AbsI restriction endonuclease. All oligonucleotides were synthesized at SibEnzyme Ltd. (Russia). Enzymatic hydrolysis products were separated by electrophoresis in 20% PAAG containing 7 M urea. Gel autoradiography was performed using the Cyclone Storage System (Packard Instrument Co., USA). All the used enzymes and markers of DNA molecular weights were produced at SibEnzyme Ltd. The primary DNA sequence was determined with Sanger method on an automated sequencer ABI Prism 310 Genetic Analyzer (Applied Biosystems, USA). The strain Arthrobacter species7M06 has been discovered in the course of bacteria screening as described previously . The characterization of the strain shows the following results. The bacterial cells are spherical with a diameter of 0.5 μm, single or arranged in pairs. Gram-positive. Obligatory aerobic. Colonies on Luria agar are pale-yellow, smooth, bright, non-transparent, convex, round, 1-2 mm in diameter. When shaken in flask, homogeneous turbidity is observed. Catalase-positive, oxidase-negative. The cells grow at the temperature from 4 to 40°C. GC-composition of chromosomal DNA is about 75%. This strain has been defined as Arthrobacter species7M06, and the isolated site-specific endonuclease has been called AbsI. Fig. 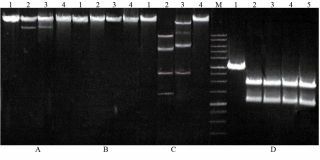 1.Electrophoresis of DNA substrates treated with restriction endonucleases. a - lambda DNA, b - T7 DNA, c - Ad2 DNA, d - pBS/ZrmI DNA. Runs: 1 - substrate DNA, 2 - hydrolysis with Sfr274I, 3- hydrolysis with PspXI, 4 - hydrolysis with AbsI, 5 - hydrolysis with Sfr274I and AbsI, M - 1kb DNA ladder. DNA sequence 5’-CCTCGAGG-3’ is a common part of the primary structure of this duplex and plasmid pBlueScriptSK(+). Figure 2b presents the data of oligonucleotide duplex K62*/K61 hydrolysis by restriction endonucleases AbsI, Sfr274I and exonuclease III from E.coli. As it is seen from this Figure, AbsI cleaves oligonucleotide duplex K62*/K61, and the length of the DNA fragment obtained as a result of the duplex cleavage coincides with the length of the DNA fragment produced as a result of cleavage with restriction endonuclease Sfr274I. Thus, enzyme AbsI recognizes the DNA sequence 5’-CCTCGAGG-3’, and the positions of oligonucleotide hydrolysis with enzymes AbsI and Sfr274I coincides, i.e. both enzyme cleave the DNA in the sequence 5’-CC↑TCGAGG-3’ after the second cytosine. Table 1 One nucleotide substitutions in recognition sequence 5’-CCTCGAGG-3’ and their positions in lambda, T7 and Ad2 DNA. To determine a possible multiplicity of the established AbsI recognition site, we analyzed the presence of DNA sequences, differing from the sequence 5’-CCTCGAGG-3’ in one nucleotide, in some substrates. Table 1 presents the data on the existence of such nucleotide sequences in lambda, T7 and in Ad2 DNA. Taking into account the symmetry of the sequence 5’-CCTCGAGG-3’ a total of 12 substitutions of this type are possible, 11 of them being present in the above substrates (Table 1). As AbsI does not hydrolyze lambda, T7 and Ad2 DNA, therefore, 11 DNA sequences that are present in them are not recognition sites for AbsI. In the above indicated primary structure the complementary sequences 5’-TCTCGAGG-3’ and 5’-CCTCGAGA-3’ are shown in bold. Fig. 2A presents data of this duplex cleavage by AbsI with subsequent products separation and the gel autoradiography. As it is seen from the Figure, enzyme AbsI does not hydrolyze the duplex Xho3*/Xho4 (32P-labeled chain is designated with the symbol*). Fig. 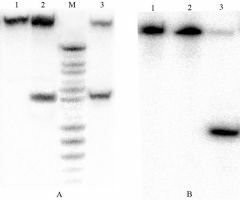 2 Determination of AbsI cleavage positions on DNA substrates k61*/K62(a) and Xho3*/Xho4(b). Runs: 1 - duplex, 2 - duplex hydrolysis with AbsI, 3 - duplex hydrolysis with Sfr274I, M - duplex hydrolysis with ExoIII. Thus, AbsI does not cleave DNA sequences which differ for one nucleotides if compare to the site 5’-CCTCGAGG-3’. The obtained data confirm that a nonmultiple nucleotide sequence 5’-CCTCGAGG-3’ is the recognition site for enzyme AbsI. Oligonucleotide duplex was ligated with pUC19 hydrolyzed by enzymes XbaI and HindIII, and the ligation product was used to transform competent E.coli cells. Among the clones obtained as a result of transformation, one was selected from which plasmid pUC19SE was isolated. Plasmid pUC19SE contains the sequence 5’-CCTCGAGG-3’ in position 434-441, which was confirmed by determining the nucleotide sequence of this plasmid. Figure 3 presents the results of cleavage of plasmid pUC19SE linearized with enzyme DriI (recognition site 5’-GACNNN^NNGTC-3’). As it is seen from the Figure, AbsI cleaves linearized plasmid pUC19SE, while the initial plasmid pUC19 is not hydrolyzed by this enzyme (data not shown). Fig. 3Puc19SE cleavage with AbsI. Runs: 1 - 1kb DNA Ladder, 2 - puc19SE/DriI, 3 - puc19/DriI treated with AbsI. Among all known rare-cutting restriction endonucleases, AbsI is the only endonuclease, which has no recognition sites in the standard substrates (lambda, T7 and adenovirus type 2 DNA) used in the search for new restriction enzymes. As XhoI and AbsI contain the same palindromic hexanucleotide sequence 5’-CTCGAG-3’ in their recognition sites and cleave it in the same positions, it might be supposed that evolutionally endonuclease AbsI originated from RE recognizing the site 5’-CTCGAG-3’. Besides AbsI, XhoI and its isoschizomers some other enzymes with a different specificity having recognition sites with the inner sequence 5’-C^TCGAG-3’ are known. Among them, we can mention the newly discovered restriction endonuclease PspXI recognizing the degenerate eight-bases sequence 5’-VC^TCGAGB-3’, which may be considered as an intermediate link between enzymes having hexanucleotide and non-degenerate octanucleotide recognition sites . In addition, XhoI isoschizomer is known, which hydrolyzes the site 5’-C^TCGAG-3’ except if dinucleotide C T precedes it, i.e. this enzyme does not cleave the sequence 5’-CTC^TCGAG . AbsI is a new and promising instrument for gene-engineering works, which may be used at large genomes fragmentation. Besides, upon DNA cleavage with AbsI the same sticky ends are formed as at hydrolysis with restriction endonucleases XhoI (5’-C^TCGAG-3’), PspXI (5’-VC^TCGAGB-3’) and SalI (5’-G^TCGAC-3’). Thus, the new site-specific endonuclease AbsI can be used together with these enzymes at DNA fragments cloning. Roberts R.J., Vincze T., Posfai J., Macelis D.REBASE restriction enzymes and methyltransferases // Nucleic Acids Research. – 2003. – Vol.31. – P.418-420. Berdgy’s bacteria determinant / Edited by G. Hoult et al. : 9th edition in 2 volumes: Translated from English Edited by Acad. RAS G.A. Zavarzin. – Moscow, 1997 (in Russian). Dedkov V.S. The determination of GC-composition in bacterial DNA with restriction endonucleases // Biotechnology. – 2004. - N 4. – P.77 – 82 (in Russian). Short J.M., Fernandez J.M., Sorje J.A., Huse W.D. Lambda ZAP: a bacteriophage lambda expression vector with in vivo excision properties // Nucleic Acids Research. – 1988. – Vol.16. – P.7583-7600. Gingeras T.R. and Brooks J.E. Cloned restriction /modification system from Pseudomonas aeruginosa // Proc. Natl. Acad. Sci. USA. – 1983. – Vol.80. – P.402-406. BSA – bovine serum albumin.